Glass or Stone Backsplash Tile? At Transworld Tile, we regularly help families in the San Fernando Valley choose from a number of backsplash tile colors, textures, and options. Often, this decision comes down to a porcelain or stone tile compared to a glass tile. When you’re looking at various tile backsplash options, much of the differentiation is found within the material used. While it sounds crazy, many of our customers come down to a final two or three options where one selection is glass and the other is stone, often in wildly different colors and styles. By understanding why this happens, we can shed some light on which type of tile may be right for you. When we get people in the store that repeatedly say they’re “just looking,” only to approach us with a couple of selections for advice and bulk pricing 30 minutes later. The most interesting part of this, however, isn’t typically found in their insistence that they’re only looking at tiles, but in the fact that they’re only looking at tiles. So, when our team finally gets to help them with the deciding vote for this tile or the other, we start by asking questions – chiefly, what does your kitchen already look like? Of course, there is nothing wrong with getting a tile you like; you should actually love the tiles you choose for your backsplash, but that decision should be greatly influenced by what your kitchen already looks like. If you’re thinking of going with a slightly glossy white subway tile or a semi-translucent aqua glass tile, then we want to know whether your countertops and cabinets are also a lightly-sheened white or feature a color that will be complemented by the choice of aqua. You’d be surprised how often we see an instant “ah-ha” moment on the faces of our customers when we ask the simple question of “well, what does your kitchen look like?”, because they suddenly realize that one of the choices will simply work much better than the other. When you’re considering your kitchen and personal preferences at the same time, you’ll quickly realize that the visual texture of your tiles is surprisingly difficult to choose. For instance, even if you knew that you wanted a specific color or look for your tile, the decision is far from settled. Even when starting with such a large stylistic head-start, you still have to choose how your tiles will need to appear in comparison to other elements in your kitchen, including lighting, other installations, and even the square footage of the tile itself. Basically, choosing a texture is complicated. The reason that many families come down to a glass and a stone tile, in our humble opinion, is found in the fact that they have figured out much of what they want, but are completely at a loss for picking the perfect texture. Of course, it helps if you know the texture of surrounding elements and have been considering visual texture and thematic style from the onset of your project, but getting the expert advice of our backsplash tile pros is a close second. Color – Tile backsplash grout is most easily defined by its color. You can opt for a bright white, charcoal grey, or a wildly outlandish color, and each will create a very different visual effect for your kitchen. Spacing – While tile spacing has less to do with grout and more to do with installation, the space between tiles will show more or less grout, depending on the spacing. Obviously, this has an impact on the final presentation of your tiles. Translucency – When you choose a glass or other potentially translucent tile option, then you’re going to have to carefully consider how grout will change the way your grout color looks through your tiles. The effects can be dampening, heightening, and everything in between. Highlighting – While grout offers the important utilities of holding your tiles in place on the wall and in relation to one another and keeping food and moisture from resting in between your tiles, they also help to highlight the tiles, which can make them match your kitchen more or less, all depending on the grout you choose! Interestingly, with current tastes and styles taken into account, both glass and stone tiles are in style for 2017. Basically, this means that we see a good amount of San Fernando Valley homeowners choose both of these staple style designs every single week. 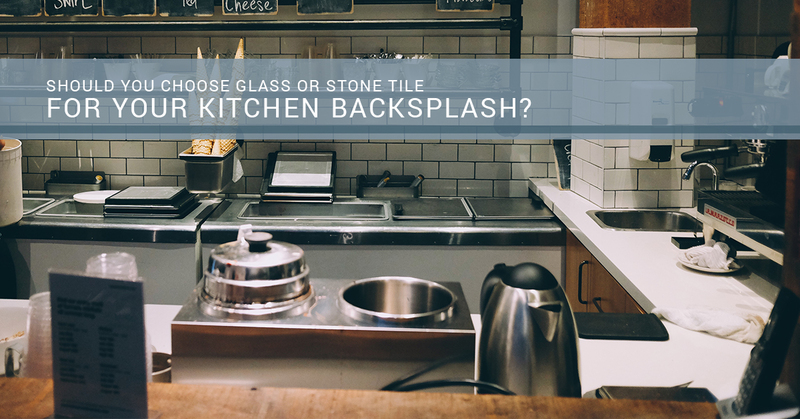 If you’re torn about glass or stone in your home, then snap a photo of your current kitchen (or bring in texture samples) to the Transworld Tile team for the deciding vote.